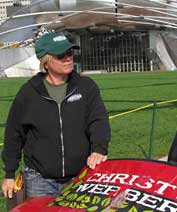 Longtime East Village landscaper Christy Webber was interviewed by National Public Radio senior correspondent Ketzel Levine for her Morning Edition series "American Moxie: How We Get By." The Dec. 22 report tells the history of Webber's business and her business' challenges in the current recession. The interview includes appearances from her son Oliver Webber and partner Jennifer Rule. The following day's story focuses on Webber rebound from a challenging contracting job, the installation of Millennium Park. The series on surviving economic setbacks has its own back story. NPR laid off Levine before the reports aired.